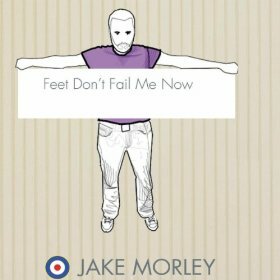 "Feet don't fail me now" is the first single to be taken from Jake Morley's forthcoming album "Many fish to fry". It's a hard one to describe - I'd say it's a cross between, pop and rock, but that's not really doing it justice. The song has a great tune, and for the backing vocals he has a choir singing them - they really add a lot to the power and richness of the song, and it does feel as though it should be from a movie soundtrack. This is a great song that just puts a smile on your face when you hear it. If the rest of the album lives up to this standard then it should be a big seller. "Feet don't fail me now" will be released on March 12th.